Summer is the time for salads and with all the options of fresh seasonal vegetables at hand, the combinations are endless. But – what’s the secret to building one that satisfies me until dinner instead of feeling like snacking at 3 pm? I think the answer is a combination of textures, flavors, protein and a tiny bit of fat. If each ingredient is seasoned enough to stand on its own, then every bite is an explosion of deliciousness. This post is sort of blueprint for a salad that satiates. I love spinach, hard boiled eggs and red wine vinegrette together. Of course any item can be switched out to whatever is at hand or individual tastes; just make sure to use a nice big plate! Greens- about two cups – pick just one variety such as spinach as I did here or mix it up with a combination of several. Dressing – to drizzle on the greens – choose the vinaigrette I used or go for a flavored oil with an acid such as lemon or any kind of vinegar. Roasted or grilled vegetables – try broccoli, cauliflower, even cherry tomatoes. It’s easy to oven roast any veggie at 350 degrees for about 50 minutes but here I used eggplant and zucchini cooked on the grill to acquire a wonderful smokiness. Wash off and dry the eggplant and zucchini. Cut off the ends and slice into 1/2 inch rounds. Place cut vegetables on a large sheet of heavy duty aluminum foil. Crimp up the edges. Drizzle the olive oil over the vegetables. Put salt, thyme, marjoram, garlic, and pepper in a small bowl and whisk together. Sprinkle over the vegetables and with clean hands, gently toss to distribute seasoning. Heat up grill to medium high heat and place the vegetables on their foil sheet on the grids. Close the grill cover and cook for 20 minutes, turning the vegetables over at the 10 minute mark. Allow to cool before placing on top of salad greens. 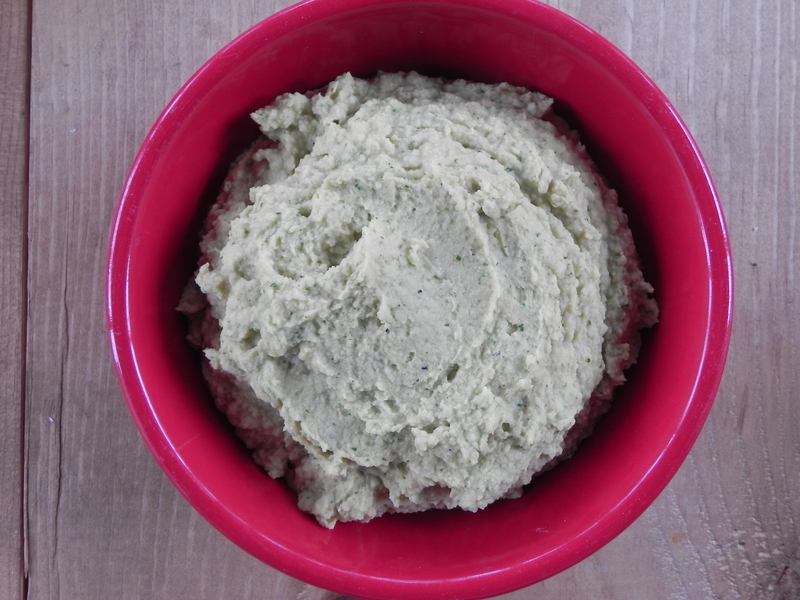 A legume spread – I used 1/4 cup hummus here, but any rinsed and drained bean such as black or great northern beans could be processed into something yummy. 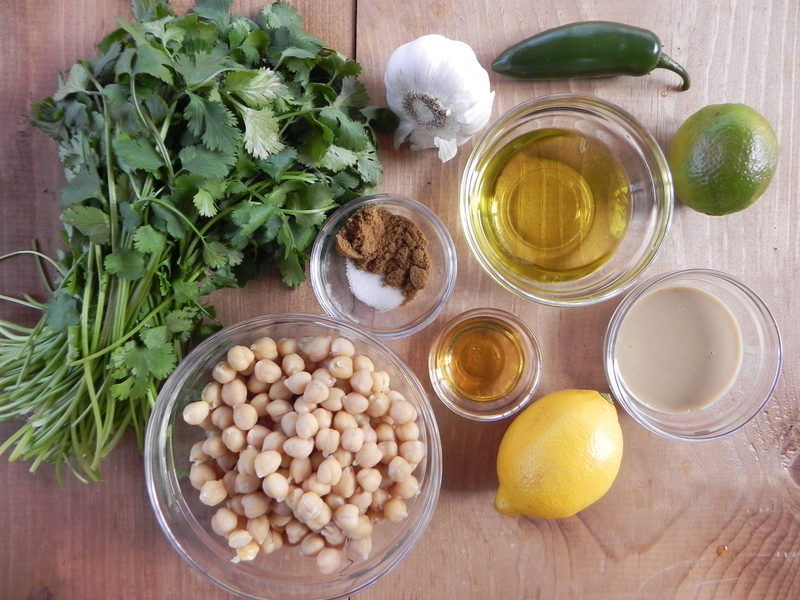 Combine the beans, garlic, jalapeno, chili, tahini, lemon juice, lime juice, agave nectar, cilantro, cumin, cayenne, and salt in a food processor and blend well. Slowly pour in the olive oil as the mixture is processing until the mixture is smooth. Transfer to a bowl and refrigerate until ready to serve. A little something extra – pour a little good olive oil over the hummus and then sprinkle with Aleppo pepper. 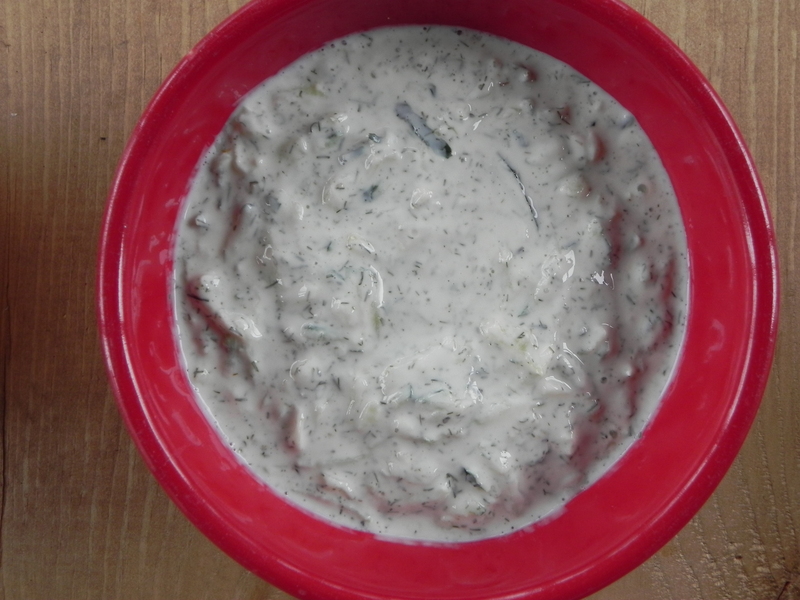 A great sauce – 1/4 cup of savory yogurt- optimizes the chance that a salad will satisfy. People with a dairy intolerance could substitute something wonderful like the jarred artichoke red pepper bruscetta that at Trader Joe’s. Blend all ingredients except turmeric in small bowl. After spooning on serving platter, sprinkle a dusting of turmeric powder on top. Protein – any choice – keeps hunger away. I love the combination of spinach, eggs, and red wine vinegar but shredded chicken, beef, or pork would work as well. Shrimp would be amazing too. Gently place large eggs in a pan of enough cool water to cover them. Place on burner set to high and immediately set timer for 20 minutes. When the timer goes off, run cook water over the eggs. Peel when the eggs have cooled down enough to touch. Pickled vegetables – The cheating way- are so quick and easy to make. Since they crown the salad plate and are the last layer to be put on, they have plenty of time to soak up tangy vinegar. 1 cup sliced vegetables such as cucumber, beet, carrots, bell pepper, red onion, etc. Place vegetables in a small bowl. If using, mix the salt and sugar into the vinegar. Pour the vinegar over the vegetables and allow to sit at least five minutes before using. So I’m curious- what other great combinations are there out there? Please tell – I’d love to try them! My friend Marina is all about healthy eating. She makes it a point to be up to date on all the latest research and is a mini-encyclopedia of knowledge on what foods benefit the body and which ones to avoid. However, she is a great cook and loves delicious recipes. I got a call from her a couple months back, right after she had returned from a trip to Scottsdale, Arizona. All I can say is that she was very enthusiastic: “Julie!, Julie! – you’ve got to figure out how to make these dishes we had at this restaurant. It’s called True Food Kitchen and it’s fantastic!” I knew what she was talking about because Jenn and I had eaten in a True Food Kitchen restaurant when I visited her in California. We both fell in love with it and I posted a copy cat recipe for their Autumn Salad HERE. The True Food Kitchen restaurant chain was started by a doctor, Andrew Weil, who developed an anti-inflammatory diet. The thing is – everything was scrumptious – it sure didn’t taste like health food. At any rate, I was more than happy to experiment and figure out how to duplicate their “Inside Out Burger”. I looked up the menu on line and even found a photo without a recipe on Pinterest. 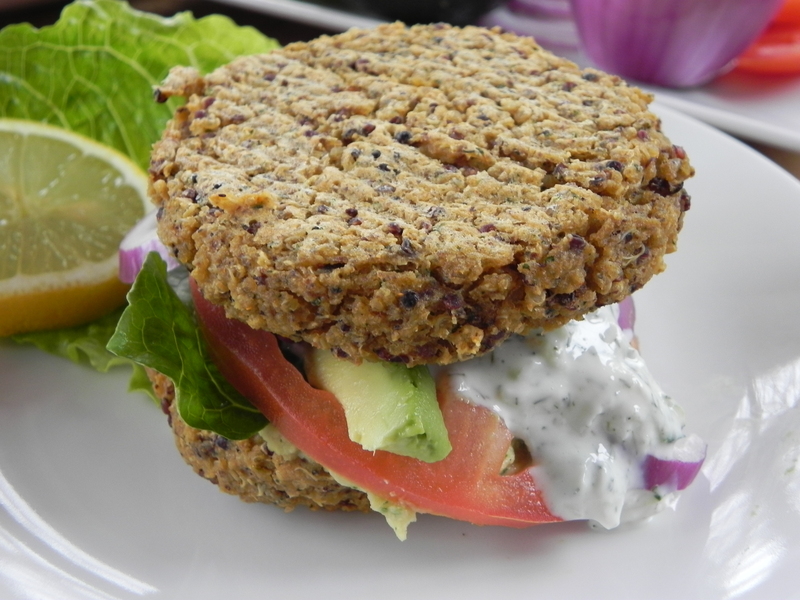 The hummus recipe posted here is from the 2012 True Food Cookbook by Dr. Weil, but the quinoa burger is a hopeful duplicate. When I ate at the restaurant, I didn’t order it, so this is a stab in the dark. 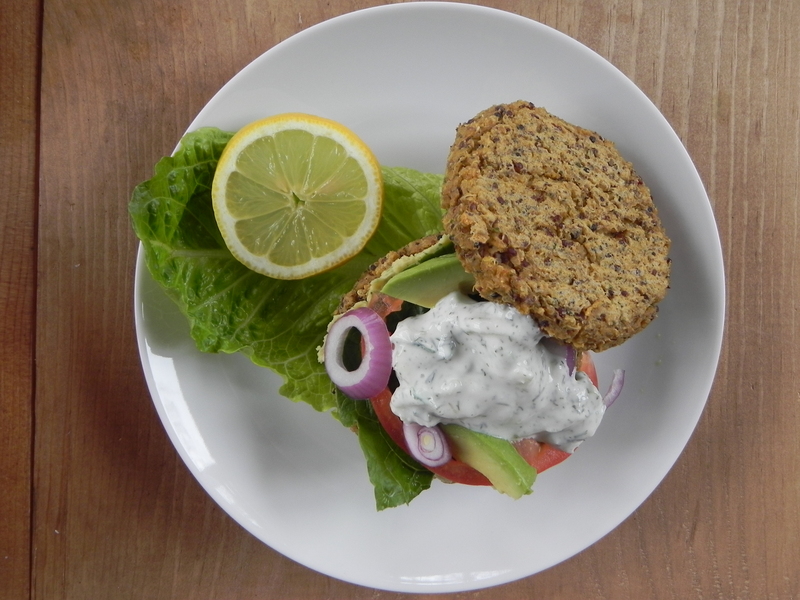 What I do know is the combination of this quinoa burger with the tzatziki sauce, humus, and veggies is nothing short of magical! *The quinoa is a lot more flavorful if cooked in broth (vegetable or chicken). Heat oven to 375 degrees. 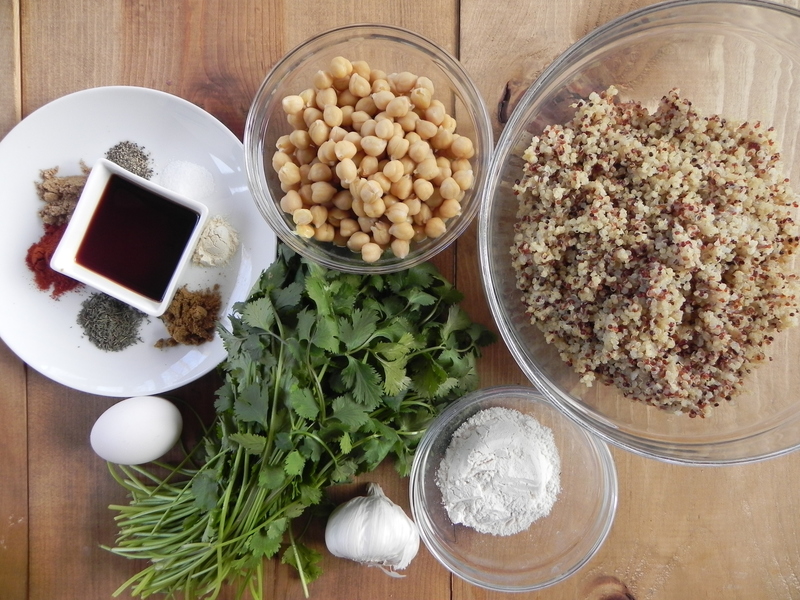 Using a food processor, combine the garbanzo beans, 2 cups quinoa, egg, flour, cilantro, tahini, soy sauce, thyme, cumin, paprika, garlic powder, coriander, salt, and pepper. Place the mixture in a bowl and stir in 1 cup of quinoa. Cover and place in the refrigerator for an hour. (This step can be skipped, it just makes it a bit easier to handle.) Line a baking sheet with parchment paper. 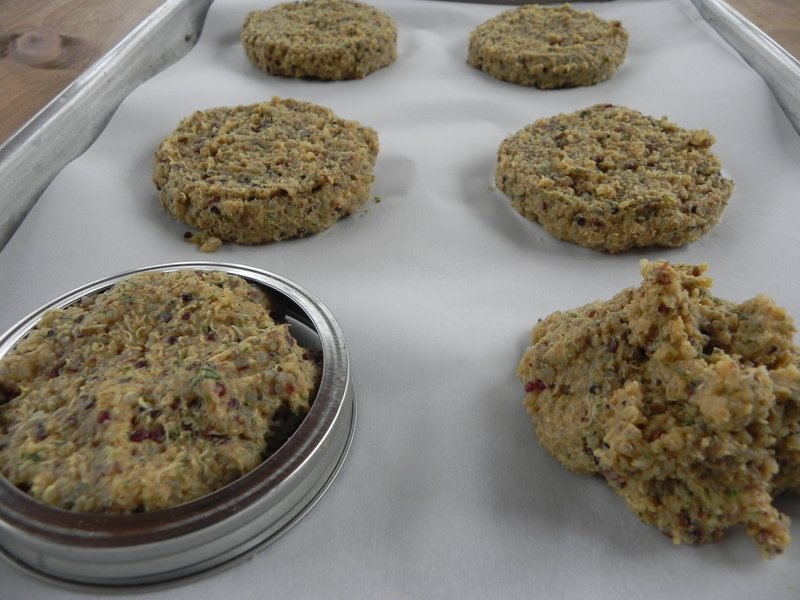 Use about a 1/2 cup of the “dough” to form 6 patties or about 1/3 of a cup for 8 smaller ones. Place each patty on the baking sheet. To give them an even more uniform shape, put a ball jar lid ring over the top of each patty and using a rubber spatula, smooth out the top. Then, carefully remove the ring. Use the pint sized for the larger patties and the 8 oz. cup ones if making smaller patties. Place in the oven and bake for 30 minutes, gently turning once at 15 minutes. While they are baking make the hummus and tzatziki sauce. Put the Greek yogurt in a mixing bowl. Slice the end off the cucumber, cut into fourths lengthwise, and remove the seeds. 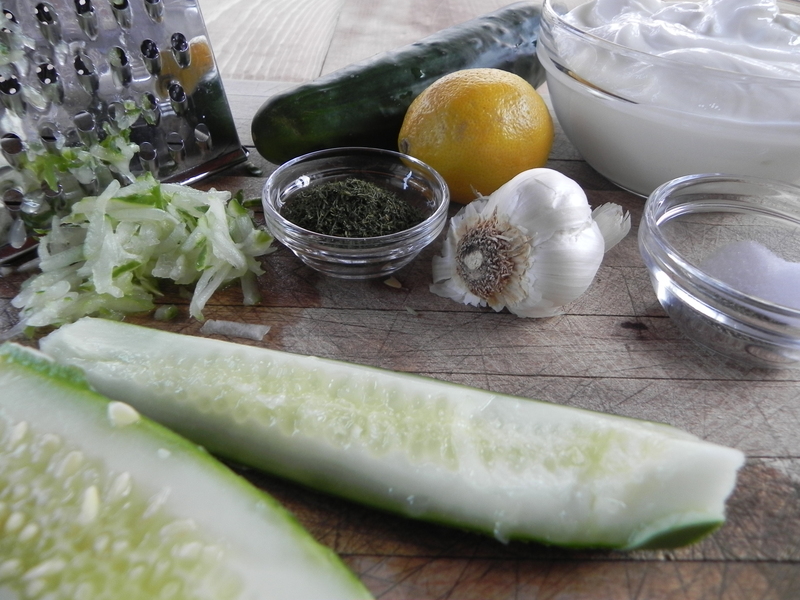 Grate the cucumber pieces, skin and all, and add them to the yogurt. Put the peel the garlic cloves and put them through a press. Then add the garlic, lemon juice, dill, salt, and pepper to the bowl. Combine well, transfer to a serving bowl, and refrigerate until serving time. Serve with the hummus, tzatziki sauce, lettuce, avocado slices, tomato slices, red onion and crumbled feta cheese. 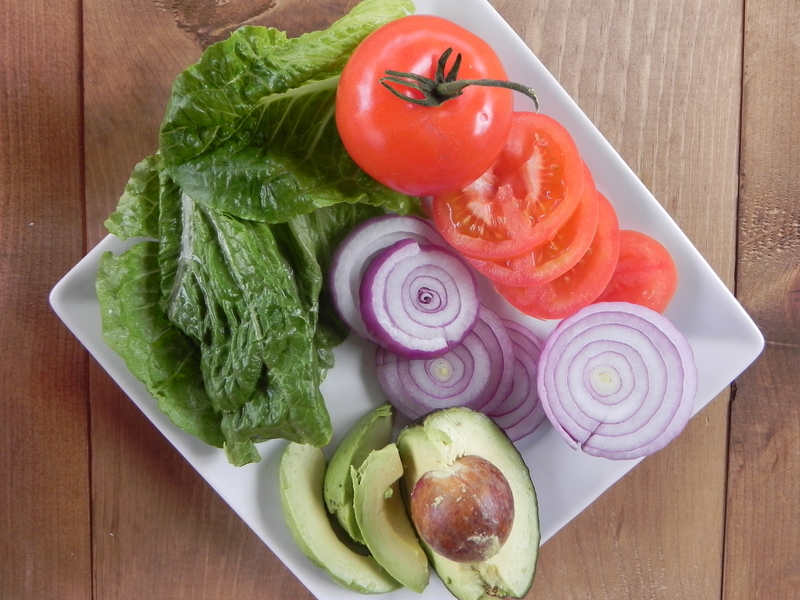 These can be eaten just like a burger with a bun, or presented as the top and bottom buns with the lettuce, avocado, and red onion in the middle as True Food Kitchen does. 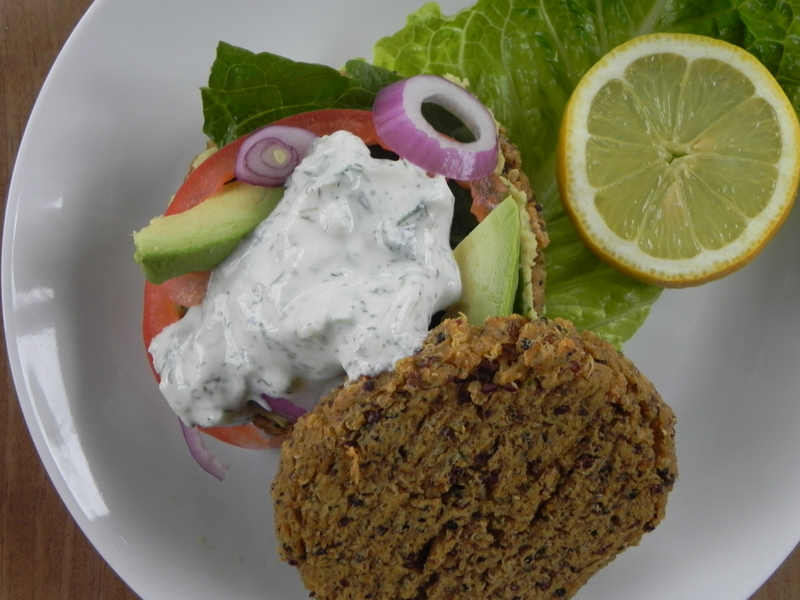 Just put 2 tablespoons hummus on the bottom patty, then veggies in the middle, cover with 2 tablespoons tzatziki sauce, sprinkle with 2 tablespoons crumbled feta, and top with a second patty.